St. Malachy's Prophecy True Once Again! The Pontiff after John Paul II was given the symbol, the Glory of the Olives, or Benedictine, signifying either a man of the Order of St. Benedict or one taking the name, thereof. Below you will find several traditional Catholic prayers for the Pontiff and the Catholic Church. 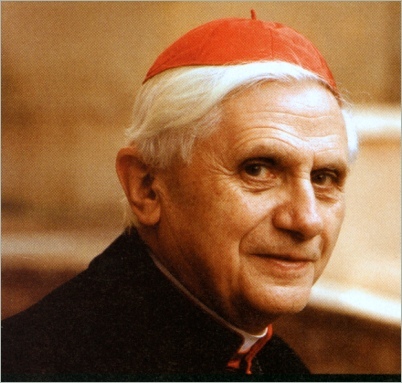 Please pray for our new Holy Father Pope Benedict, that he is willing to safeguard Sacred Tradition to the point of Martyrdom if need be. Pray for the Holy Father, very much-----pray for him daily because he is already being pressured to "moderate" doctrine, not just his approach; we ought to pray that God will not chastise us through a weakened Pontiff, for our own infidelity and sins, if that be His Will: may God's Holy Will be done, praised, thanked and accorded its supreme due in all things, on on earth, under the earth, as it is in Heaven. Last year the Holy See permitted a non-binding, that is, not infallible, statement to be circulated indicating that Jews do not have to convert to be saved. This was not only not infallble, it was heretical. It did not make sense to me. It is one thing for a Pope or a prelate to hold opinions that do not always comport with Tradition, but it is quite another to promulgate these in some official capacity, even if not ex cathedra, that is, infallibly defined by the Roman Pontiff himself or defined by a Church council in union with him. I recalled an interview that the future Benedict XVI had with EWTN just a couple of years ago. He clearly said that the Jews' Savior was Jesus Christ, they were His Own people and He would convert them. So when EWTN reran that interview after his ascension to the Chair of Peter, I tuned in again. I was not mistaken: Pope Benedict XVI, when he was still a Cardinale, had not veered away from the dogma of the faith, "no salvation outside of the Church". So it would seem that the above referenced statment that made such a stir in the media was indeed unprecedented; perhaps the Vatican found itself at sea because someone in power issued a statment they had no authority to do so, as they cannot, by definition alter doctrine, in a public relations nightmare. It has happened before. I am not certain of its genesis, or how it became to be promulgated at all. It appears that it could not have been from the authority of the then head of the Comgregation for the Faith, per se. Our Holy Father has a number of such "messes" that can easily lead to scandal, to straighten out, so we must pray very hard, indeed for him. Jesus, Supreme Pontiff of the New and Eternal Testament, Thou art seated at the right hand of God as a perpetual Advocate for us and are pleased to be for all time with Thy beloved spouse the Church and with Thy vicar who governs her. Divine Prince of the pastors of Thy flock, You have deigned to place on the throne of Peter Thy servant and Pontiff, Pope N . . . Make him, in the midst of the wickedness of our times, mild in hostile attacks, strong in the defense of the faith, and a gentle father and watchful master in the pastoral office. May Thy Kingdom come, Immortal King of the ages! May the truth, which Thou hast brought from Heaven, reach even to the ends of the earth. May the fire which Thou willest to be cast upon the earth inflame all hearts. This is the desire that is in the heart of Thy vicar: a desire to reconcile all men to Thee; a desire for concord and forgiveness among nations; a desire for justice and peace. Jesus, enlighten Thy vicar. Strengthen him in his sorrows and in his universal cares. Speak that powerful word, O Lord, which shall change minds, turn hate into love, check the fury of human passions, temper the sufferings, and dry the tears of those who are in sorrow. Increase the virtue and the resignation of families and pacify nations and peoples so that the Church built by Thee on Saint Peter to gather all people around Thine altar of life and salvation, may invoke Thee, adore Thee, and exalt Thee in peace forever. Amen. V. Let us pray for our Pontiff N . . .
R. The Lord preserve him, and give him life, and bless him upon earth, and deliver him not up to the will of his enemies. O God, the Shepherd and Ruler of all Thy faithful people, mercifully look upon Thy servant N., whom Thou hast chosen as the chief Shepherd to preside over Thy Church. We beg Thee to help him edify, both by word and example, those over whom he has charge, that he may reach everlasting life together with the flock entrusted to him. Through Christ our Lord. Amen. Almighty and Everlasting God, have mercy on Thy servant N., our Supreme Pontiff, and direct him, according to Thy loving kindness, in the way of eternal salvation, that with Thy help he may ever desire that which is pleasing to Thee and accomplish it with all his strength. Through Christ our Lord. Amen. 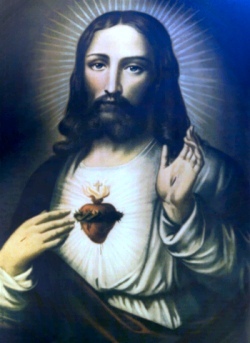 Lord Jesus, shelter our Holy Father the Pope under the protection of Thy Sacred Heart. Be Thou his light, his strength and his consolation. Note: we supplied Thou and Thee for Your and You in the above prayers, in keeping with the traditional Raccolta form below. 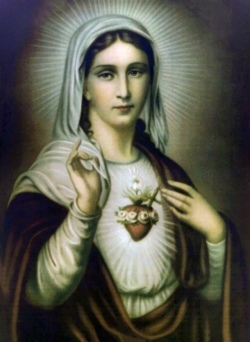 Most holy Virgin and Mother, whose soul was pierced by a sword of sorrow in the Passion of thy Divine Son, and Who in His glorious Resurrection wast filled with never-ending joy at His triumph; obtain for us who call upon thee, so to be partakers in the adversities of Holy Church and the sorrows of the Sovereign Pontiff, as to be found worthy to rejoice with them in the consolations for which we pray, in the charity and peace of the same Christ our Lord. Amen. O invincible defender of Holy Church's freedom, Saint Gregory of great renown, by that firmness thou didst show in maintaining the Church's rights against all her enemies, stretch forth from Heaven thy mighty arm, we beseech thee, to comfort her and defend her in the fearful battle she must ever wage with the powers of darkness. Do thou, in an especial manner, give strength in this dread conflict to the venerable Pontiff who has fallen heir not only to thy throne, but likewise to the fearlessness of thy mighty heart; obtain for him the joy of beholding his holy endeavors crowned by the triumph of the Church and the return of the lost sheep into the right path. Grant, finally, that all may understand how vain it is to strive against that faith which has always conquered and is destined always to conquer: "this is the victory which overcometh the world, our faith." This is the prayer that we raise to thee with one accord; and we are confident, that, after thou hast heard our prayers on earth, thou wilt one day call us to stand with thee in Heaven, before the eternal High Priest, Who with the Father and the Holy Spirit liveth and reigneth world without end. Amen.